It’s move-in day! 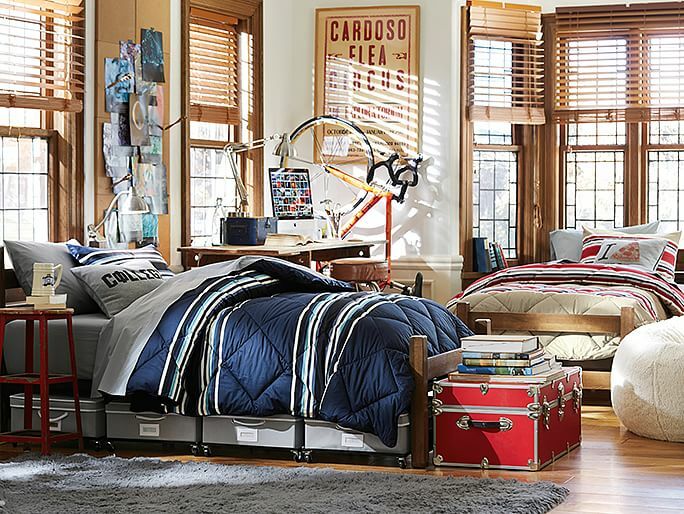 Whether you are entering college as a freshman or winding down your senior year, you deserve a dorm room that is stylish and functional. Versatility is key; use a storage trunk or stool as a bedside table and decorate a cork board with art and photographs along with your class notes. 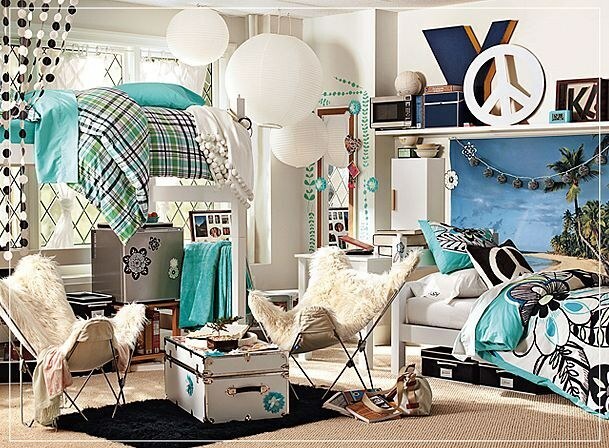 If you are sharing a dorm room, be sure to make a design plan with your roommate and decorate the room together. Nothing ruins a well designed dorm room faster than half of the room being a mismatched mess! 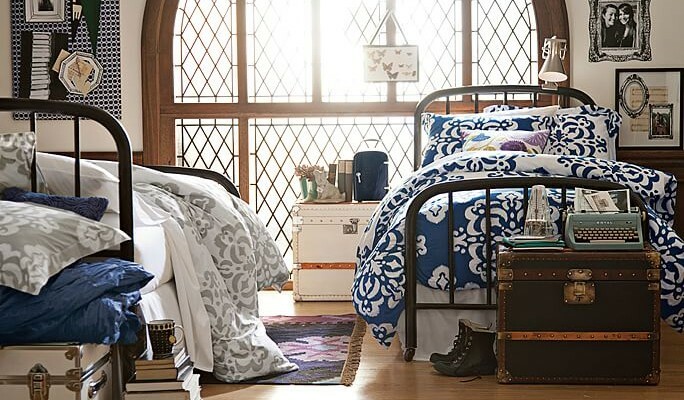 Get inspired with these stylish dorm room combinations. The spaces were created with the use of just five components: Storage, lighting, seating, textiles, and decor. Storage: Trunks and under-the-bed storage bins are the ideal way to store your stuff. Underbed storage bins $24 – PB Teen. Hanging file cart $55 – Wayfair. Damask storage trunk $170 – Target. Lighting: A well-lit dorm room isn’t only a necessity for studying but being surrounded by soft white light enhances your mood. 14” study lamp $32 – Wayfair. Metal tree floor lamp $104 – Target. Seating: The butterfly chair and the pouf are synonymous with dorm living. They can be moved around the room, then stored out of the way when not in use. Faux leather butterfly chair $39 – Wayfair. Sphere pouf $110 – Target. Textiles: Don’t skimp here! 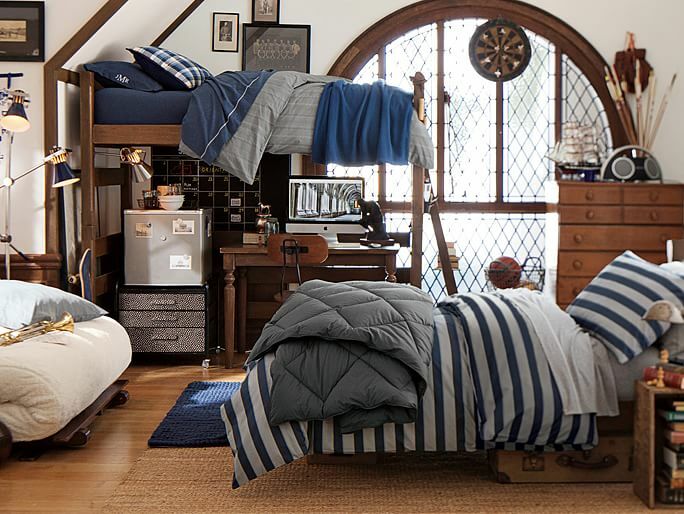 High quality bedding and rugs are the backdrop to a stylish dorm room. Duvet covers and bedding from $19 – PB Teen. 7 piece XL twin comforter set $52 – Wayfair. Decor: Surround yourself with the things you love and give your new friends a glimpse at your personality. Wall art from $39 – PB Teen. Ampersand memo board $99 – Wayfair. Chevron cork board $10 – Target. Checklist: Decorating your dorm room is easy with these simple steps, courtesy of PB Teen’s Dorm Room 101. PB Teen makes it even easier to be sure you have all of your dorm room necessities, just print off your school’s dorm room checklist here. *All prices accurate at time of publication.